As a Matter of Opinion: New Addition to the Twilight Series! Oh my goodness, I just heard that Stephenie Meyer is releasing a new book in June! "The Short Second Life of Bree Tanner, An Eclipse Novella." 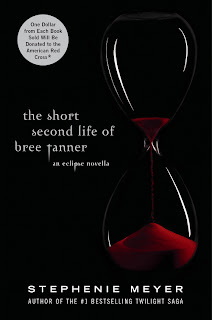 It's a short story (around 200 pages), which compliments "Eclipse" and goes into the background of Bree, one of the newborn vampires of Eclipse. They will be releasing the hardcover book on June 5, 2010! But ALSO, Stephenie will be placing the book online for fans to read for free from June 7th - July 5th at www.breetanner.com. I am FINALLY reading the first book now!!!! I JUST SAW THIS ON PEREZ!!! hahah I'm so excited!! Am I the only one who likes the movies more? I will still probably buy it! visit my new beauty blog, everyday one lucky commenter will receive a gift! For the launch, I am going big and giving away a coveted La Mer 1. oz creme valued at $130! So exciting! You just made my day!! You're not a nerd. You just like the wrong vampire series. Buffy rules forever. So sayeth king nerd copyboy! I about peed myself when I saw this today too! I am right up there with you in the nerd department! That is really cool! If we ever become famous authors we'll have to remember how classy that is! I can't wait!!! Have you read The Host by Stephanie Meyer? It's no Twilight, but still pretty amazing! I just read Eclipse while on vacation last week! Thanks for letting me know. I just have to finish the last book in the series...still dying to know what is going to happen. And then I'll be ready for this one!